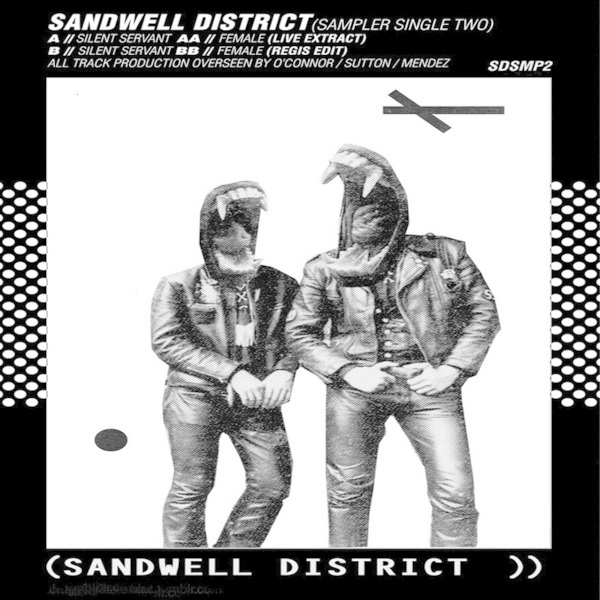 Second of two samplers for the highly anticipated Sandwell District album! The group are out in full force again, with two tracks from Silent Servant complemented by cuts from Regis and Female. Those two Silent Servant efforts are simply immense. On the a-side dry boulder kicks and geyser release valves set the scene for a sublimely star-eyed synth wash, while his flipside finds its depth with sonar bleeps and spindly metronomic percussion before the darkest synthline you've heard in years injects surroundings with impenetrably inky blackness. Female's 'Live Extract' sounds kinda like he left a Gas CD playing in the background while he makes a brew and writes an email, eventually a mobile phone signal disturbs the peace and he turns the DAT off. Maybe? The Regis edit of this sounds like a workout theme for a synchronized dubtech dancing team from Siberia. F*ckin' reight mate. Essential!